These are my Tropic straps. They are locally sourced here in Taiwan and sells for USD 10. I think they are cheap, but that does not mean that they are not good. In fact they are pretty good for the price. I have 2 sets, one 20 mm and the other 22 mm. Before we start on the review, I need to highlight that in the photographs, the straps seem dirty and full of lint. That was done on purpose as this is one of the problems with the Tropic strap. The second is that I seem to be having some problems with the white balance on my camera, so the straps are black and not blue. A bit of history. The Tropic strap is popular because early Rolex and Tudor Submariners were issued with the Tropic rubber straps as were Blancpain Fifty Fathoms sold by LIP (in the 60s and 70s). 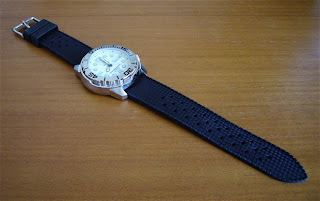 A number of divers watch, those collectively known as super-compressors (like the Longines Legend Diver, IWC Aquatimer amongst others) were issued with Tropic straps. The 20 mm is fitted on the Omega Seamaster Professional 2254.50 and the 22 mm is fitted to a Seiko 5 Sports Lumibrite SNZF07J1 (7S36-02V0). The Seiko came with a metal bracelet, but has since then been fitted with the Z22 straight and curved vented straps. OK, on with the 20 mm Tropic strap. The strap measures 70 mm on the buckle side and 120 mm on the other side. The strap is 20 mm at the lug point and tapers down to 18 mm at the tip. The tip is pointed and the strap has the basket weave design on it. 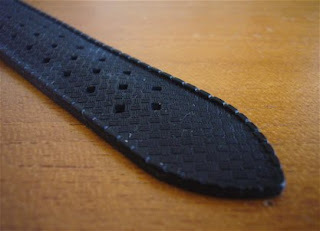 The strap is profiled across its width. It has a lip at the ends and measures 3 mm at the ends, 3 mm at the center which is raised and 2 mm just after the lip at the ends. You can see the profile in the photograph below. 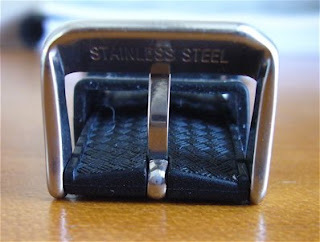 The buckle is made from stainless steel (marked at the bottom of the buckle) and is polished. The finish of the buckle is good for the price. The strap comes with 2 strap keeper. Also the strap has that familiar vanilla smell popular in the 70s and early 80s. As such, it is indeed a great homage to the Tropic straps of past. Current modern rubber/ silicon no longer have this vanilla smell. As indicated by the photographs, the only problem that I have with the straps is the fact that it picks up lint very very easily. However a brief run under the tap solves this problem. 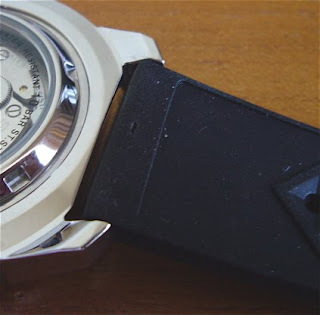 The 22 mm strap is similar to the 20 mm strap. 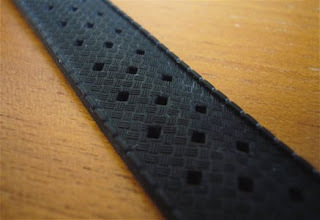 In fact I can get these straps in the following sizes: 18 mm, 20 mm, 22 mm and 24 mm. 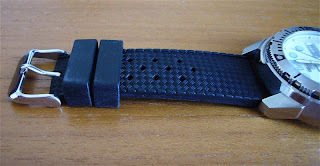 As with the 20 mm the strap is soft and comfortable to wear. It can stretch a bit and that makes it a bit more comfortable. The 22 mm is the same length as the 20 mm, 70/120. The buckle holes as with the other holes on the strap is reinforced by a web-like structure. 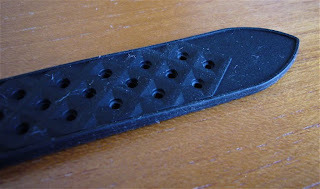 This structure does not extend across the strap, just over the holes. This gives the strap a bit of space for venting purposes. There is another problem with the 22 mm strap in terms of finish. 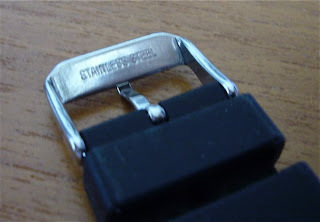 The is a small 2 mm mark on the bottom of the strap at the lug attachment point. It is not a cut but just bad finish. It does not extend all the way, just 0.5 mm deep. I guess I just missed this when I picked up the strap. Overall, I am happy with the strap. It is cheap and does not cost as much as some Tropic straps that I have seen. However those straps are Swiss and Italian made while this are Chinese or Taiwanese made. It does what it is suppose to do at a very good price. I like the look of those straps -- does the vendor have a website? USD10 seems like a good price, and I could use one or two 20mm straps. No the vendor does not have a website. I get them from my local watch shop. If you want, I can get them for you. You have my email address? Email me and we can move from there. I don't think I have it, but I should wait a while before spending any more money on watches. I had a big summer, picking up that Casio MD-703 we discussed in June, an Omega, and several vintage Seikos. I'll touch base with you about the straps in a month or two. No worries. If you are interested, just drop me a mail. 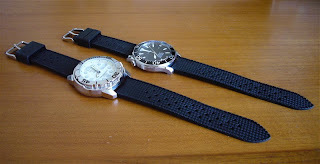 There will be more straps on review as I am getting a few more including (maybe) an original Omega rubber strap. Still trying to justify the USD 180 price tag. Where can I get this strap?